Line a baking sheet with paper towels. Spread chickpeas over the paper towels. Place a layer of paper towels over the chickpeas and gently press to remove excess moisture. Place chickpeas in a bowl. Add wing sauce and toss to combine. Add ranch dressing powder and mix well. 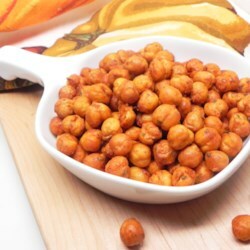 Place chickpeas in the basket of the air fryer in an even layer. Cook for 8 minutes. Shake and cook for an additional 5 minutes. Shake and cook for another 5 minutes. Shake and cook for the final 2 minutes. Let cool for for 5 minutes and serve immediately.